It’s all about relationships. We specialize in workplace law and issues that impact the employer-employee relationship. We represent employers and employees, providing advice and litigation in all workplace law matters, in addition to conducting mediations, arbitrations and workplace investigations. Our goal in these cases is to provide employment-law strategies and solutions that boost morale, improve productivity and strengthen relationships. We also have experience handling business-law matters, as well as cases involving general civil litigation. 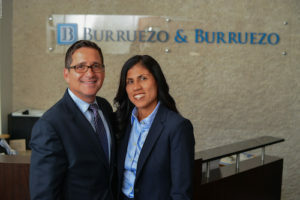 Burruezo & Burruezo offers aggressive representation in legal disputes, as well as a more holistic approach to problem solving. We assist our clients with current and impending concerns, and also offer — after a thorough review, analysis and assessment — proactive and preventive solutions to mitigate against future problems. Burruezo & Burruezo offers flexible billing approaches, depending on the circumstances and the nature of the representation. We will consider traditional, flat-fee, phase-based, and retainer billing methods.